If there’s anybody that knows how to throw a party, it’s the team at Skechers Sundown Festival. Touted as “Asia’s definitive music and arts festival”, the annual extravaganza is back for its 10th and biggest edition yet. To be held at Siloso Beach Sentosa from 19 to 21 April 2019, festival-goers can look forward to a larger-than life 3D2N party unlike anything you’ve ever seen before – complete with an exhilarating lineup of international and homegrown acts that aim to celebrate the diversity of Asian music. Just last week, the organisers have already welcomed a handful of stellar artistes such as Korean rap collective MFBTY (Tiger JK, Yoon Mi Rae and Bizzy), Chinese hip-hop outfit Higher Brothers, Japanese heavy metal band Crossfaith and Taiwanese DJ Shogun. Local favourites like Charlie Lim, Sam Rui and Shigga Shay are also set to join in the festivities. While it seems like the bill couldn’t get any better, Sundown Festival has just announced the final wave of big-name headliners to round up the festival lineup. Fronting the stage is K-pop boy band iKON, who are making their return to Singapore shortly after concluding their 2018 Continue Tour back in November. Alongside iKON, there will also be performances by Korean-American DJ TOKiMONSTA, Vietnamese EDM producer Hoaprox and Taiwanese singer-songwriter Karen Cici. For music lovers with a penchant for arts and films, you can also enjoy the screening of award-winning films, while immersing yourself in the array of sustainable art installations across the festival grounds. To cap off the festival vibes, Sundown Festival is offering a dedicated glamping experience at Campville, which will come furnished with comfy beds, fresh linen and can accommodate up to four people per tent. Or if you’re a camping enthusiast, you can choose to pitch your own tent at Freedom Camp. Forget Fyre Festival – Sundown Festival’s the real deal. 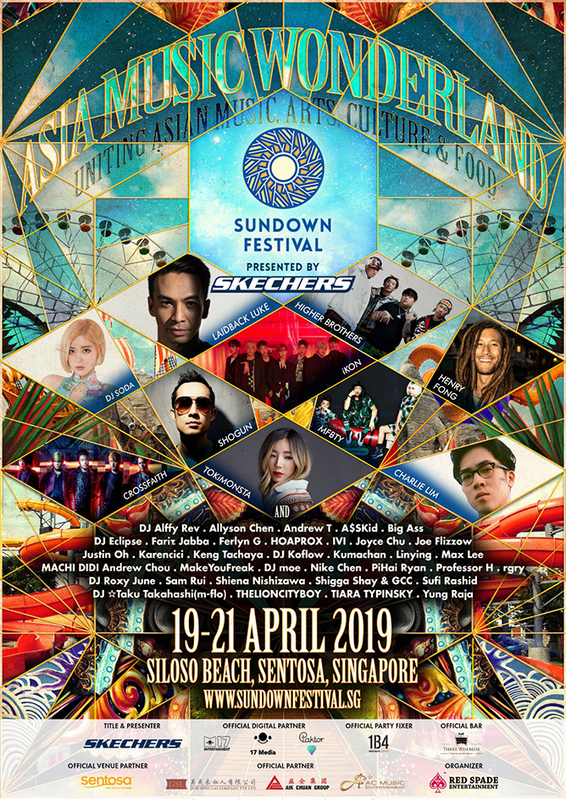 Skechers Sundown Festival runs from 19 April to 21 April 2019 at Silosa Beach Sentosa. Tickets are available at www.sundownfestival.sg. Nearly half a decade after their last gig in Singapore (including a long hiatus that followed their second album), modern rock quartet Kodaline is finally returning to our shores this March with new music under their belts. Having dropped their latest compendium Politics of Living last September, the rest of the world has been waiting with bated breath to see what the four-piece has in store for us. Before the show, we caught up with bassist Jason Boland in a phone interview to find out what the band had been up to, thoughts on potential collaborations, and how this bunch of “excited teenagers” – frontman Steve Garrigan, guitarist Mark Prendergast, drummer Vinny May and himself – from Dublin has grown to become the Kodaline we know today. Hi Jason! It’s been four years since Kodaline last stopped by for a show. Is there anything you particularly miss about Singapore? We’re going to try more street food – that was my favourite part of Singapore back then. We didn’t have the time to explore the country last round, so I want to spend some time exploring with my camera. I just want to walk as far as I can and see what I can find. What was your favourite Singaporean dish when you tried the food here last time? You dropped Politics of Living last September, but you were on hiatus for a while. What have you guys been up to? Both Vinny and I got married to our wives recently, so we had a lot of time to spend with our family and friends – just getting back to our roots. We were still making music, but by the time we actually got back to making the records, it already had been a year or so. Do you prefer the downtime or the busy tour life? I think it’s a very even mix. When you’re on the road, you just want to go home, but when you’re home, you just can’t wait to get back out. In this album, you also collaborated with plenty of notable producers. As singer-songwriters yourselves, how was it like working with them and how was the entire process like? Whenever we work with anybody, it’s really about the relationship so these aren’t just our friends at work. If we were to let someone into the Kodaline process, it takes a lot of time because you have to get on with each other – it’s like having a fifth member of the band more than having an outside person. But it was an exciting experience; these guys bring incredible colour to the table and it was nice to be able to try different things. Despite the number of collaborators on the album, it’s not often that Kodaline works with fellow artistes. Are there any acts you wish to collaborate with in the future? We’ve never really gotten the opportunity. I think Nina Nesbitt is the only female singer we’ve done a collaboration with for ‘Hold You’, and after that we did ‘Raging’ with Kygo. I think we’re very interested in trying out couple of things – we’d love to collaborate with Zedd one day. We’d also like to work with a big YouTuber. Someone like Ninja (American Twitch streamer) would be nice. In a previous interview, you mentioned that it’s an album about growing up. How has Kodaline changed throughout the years? I think at the heart of it, you might find that we’re still a group of big kids who get to play music and can’t believe their luck. So much of it is just us being excited teenagers – that’s what we really feel like, even though the life around you might not look like that anymore (laughs). We also listen to a lot of different genres of music these days. We’re huge fans of pop music now, which we probably wouldn’t have been at the very start; it’s just that your musical tastes develop as you grow up. When we first started out, we set out to be a classic band so we listen to the likes of The Beatles, David Bowie and Led Zeppelin. But now, the meaning of what a band is has changed so much. As long as the music sounds like you, it doesn’t really matter that much. You guys are no stranger to selling out shows all over the globe, yet are still able to maintain a relatively low-key image despite your fame. How do you keep the balance? I think it’s a very Irish thing that no matter how well you do, the moment you come home, your friends bring you right back down to Earth. They don’t let you get too big for your boots. We’re very lucky that it’s kind of our culture – you might see Bono from U2 walking down the street, but nobody is going to care or stop him in his tracks. You can have celebrities out and about in Ireland and no one will bat an eyelid. What about other countries? Would you get stopped if people recognise you? We only get stopped on show days; when people kind of expect to see us. I walk around with my camera – it has a pretty good camera flash and no one expects a guy in a band to be taking pictures, so it works out well (laughs). You’ve achieved so much within the span of Kodaline’s career, but what’s your ultimate goal as a band? I think the dream is just to be able to do this for as long as possible, you know? Obviously, we want to play at the biggest shows in the world and we’d love to eventually get to stadiums, but even if that doesn’t happen, just being able to play for people everywhere would be the best job in the world. We’re really grateful that we get to do it now. Any words for Singapore fans who are anticipating your concert? We just can’t wait to get out and see you guys! Sorry that it has been so long. We’re so thankful that you’re still supporting us, and that makes it possible for us to come all the way around the world and play for you. There’s going to be a ton of great music and loads of fun. Lastly, what are your plans for the rest of the year? We’re touring up until the summer, then we’re doing a lot of festivals. We’re hoping to get some new music out by the middle of the summer or end of the summer – maybe an EP or a single, we’re not really sure yet, but we’ll definitely make something new. Catch Kodaline at their one-night-only show on 5 March 2019, 8pm at [email protected] Box! Tickets are available via SISTIC. Okay, let’s get this straight: BLACKPINK is huge. And by huge, we’re talking about their ability to command a 9,500-strong crowd at their sell-out concert in Singapore as part of their 2019 World Tour [IN YOUR AREA]. If that’s not enough to prove their rising popularity, the K-pop quartet had just made their U.S. TV debut merely days prior to the show. In yet another history-making move, the girls are also set to perform at Coachella later this year, making them the first Korean female act to play at the legendary music fest. For a barely three-year-old group to achieve success on such a global scale, there’s really no doubting their immense star power at this point. And we can definitely see why from the amount of BLINKs in attendance at their Singapore show last Friday, which enveloped the entirety of Singapore Indoor Stadium in a sea of heart-shaped lights with their hammer-bongs. “It’s our first time in Singapore and it’s way better than I’d imagined. So many of you are here to see us!” Rose exclaimed in delight at the massive turnout. Despite their limited discography that consists of no more than nine songs, the ladies of BLACKPINK made up for it with their exuberant performances, top-notch stage presence and truckloads of fan love throughout the two-hour show – which inevitably left us yearning for more. But as much as we’re in favour of quality over quantity, we certainly hope the four-piece will be back with a fuller repertoire of songs that will do them justice during their next visit (which they hinted could be anytime soon). Till then, relive the highlights with our review below! We’ve been to our fair share of concerts to know that not all acts perform live due to the sheer intensity of their choreography (and that’s perfectly okay in our books, FYI), but BLACKPINK proceeded to prove naysayers wrong with their flawless vocal capabilities – all while effortlessly slaying the dance routines on stage. Take that, haters! In an adorable attempt to showcase their vocal versatility, we spotted Lisa playfully passing the mic to Rose during her rap portion of ‘DDU-DDU DDU-DU’ – to which the latter nailed the part perfectly. Shortly after, Rose sought revenge by letting Lisa take over her high note. Even though the pair was merely goofing around, it couldn’t hurt to imagine the members changing up their roles for real one day. Meanwhile, enjoy the chaelisa moment below. Although Jennie’s the only member with a solo release (aptly titled ‘SOLO’) thus far, the other girls also got their moment in the spotlight with their own individual stages: Jisoo with a soaring cover of the Zedd-assisted ‘Clarity’, Lisa with a sizzling dance performance of Jason Derulo’s ‘Swalla’, and Rose with an enthralling mash-up of Beatles’ ‘Let It Be’/Park Bom’s ‘You And I’/Taeyang’s ‘Only Look At Me’. Here’s hoping that Papa YG will grant the rest of ’em their well-deserved solo debuts soon! Both top-tier girl groups in their own right, BLACKPINK hit us right in the feels when they delighted the audience with a nostalgic cover of Wonder Girls’ 2008 hit ‘So Hot’. What else can we say, we love queens supporting queens! Coming from YG, most people would probably expect them to perform a 2NE1 track but imagine our surprise when they paid tribute to the former JYP outfit instead. Hey, perhaps we can expect a Girls’ Generation cover at the next concert? It was Rose’s birthday a few days ago on 11 February and local BLINKs decided to surprise the 22-year-old with a birthday song during the encore. Unfortunately, it wasn’t as loud as they expected it to be. After several attempts, Rose finally heard it and showed her gratitude by cutely thanking fans. Guess the project was a success after all! After finishing up their ending ments, the members launched into an emotional rendition of ‘Stay’ during the encore stage – and boy, did they indulge BLINKs with some heart-fluttering fan service. From picking up support banners to noticing fans in front rows, the night was made more memorable thanks to BLACKPINK. Our favourite moment? When Jennie bent down to comfort a crying fan, despite being teary-eyed herself. jennie knealt & said ‘dont cry, love you’. What was your favourite moment of #BLACKPINKinSG? Drop some BLINK love in the comments below! 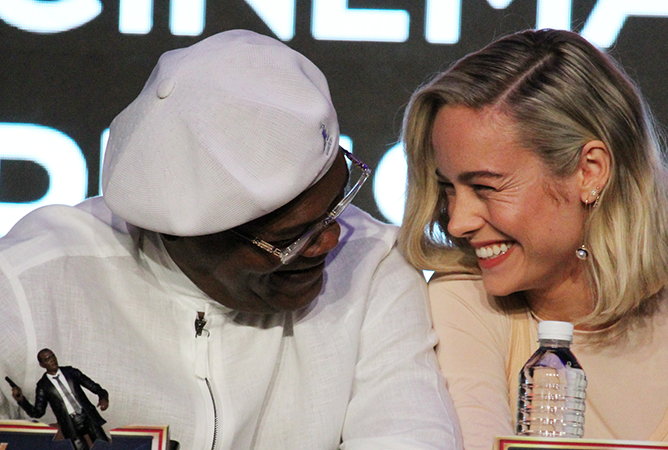 On 14 February, we met up with stars Brie Larson, Gemma Chan, Samuel L Jackson as well as directors Anna Boden and Ryan Fleck of Captain Marvel at their only promotional stop in Asia. 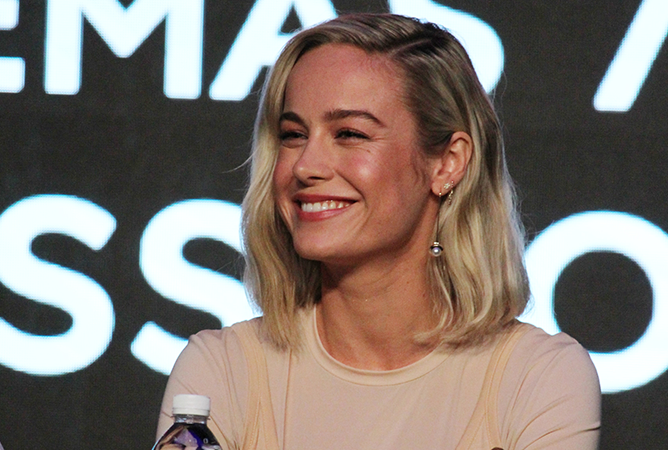 Finally making their way here after the epic announcement in January, the cast and directors of Captain Marvel were all smiles as they greeted members of the media that had gathered excitedly awaiting their arrival. Despite the morning call, everybody looked bright and fresh-faced as they took their seats, ready for the onslaught of burning questions from the floor. Seen as a breakthrough in the otherwise male-dominated MCU, Captain Marvel is the universe’s first standalone film for a female superhero, helmed by a directing duo that includes their very first female director. Though it is a pretty big deal to achieve equal representation in the MCU after over 20 films, both the creators and stars are all hoping that this will amount to more than that. In order to prep herself for her big Marvel debut, actress Brie Larson underwent nine months of intense training which comprised of weightlifting, meditating and martial arts to build her mental and physical strength, while finding a way to lend credit to the authenticity of the character. But that was not all those training sessions were for Brie, who also found time to share videos of her newfound strength with her co-star Samuel L Jackson. “When you’re pushing a Jeep up a hill for 60 seconds, I think you’re allowed to brag about it,” she added with a laugh. Fellow co-star Gemma Chan also had to undergo strenuous physical training in preparation for her new role, which is notably worlds apart from her previous stint as Astrid Leong-Teo in hit film Crazy Rich Asians. As such, having to portray the character of Minn-Erva, a member of the Kree Starforce, is definitely not a walk in the park for the British actress. “I had to start kickboxing and sniper training. My ongoing concern was trying not to accidentally hit myself in the face with my own rifle as the one I had practiced with was a bit shorter than the one used in the film,” shared Gemma with a sheepish smile. Captain Marvel opens in cinemas 7 March 2019. 2019 has barely begun, but concert announcements are already starting to roll out. Just this month alone, we’ve gotten news that not just one, but three rising girl groups are set to make their way to Singapore in the coming months. 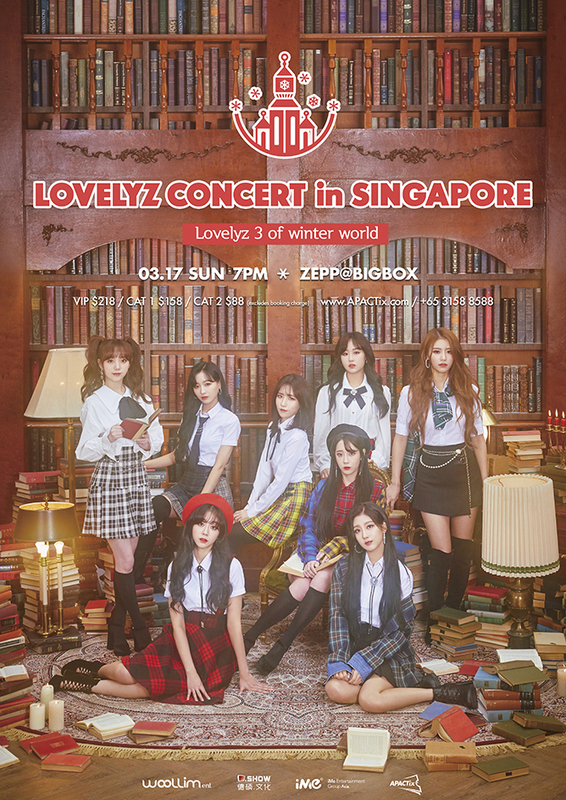 As part of their Lovelyz 3 of Winter World tour, K-pop sweethearts Lovelyz will be performing in Singapore for the first time ever. Having made their debut in 2014, the Woolim girl group has been gradually earworming their way to everyone’s hearts with their bubblegum tunes and girl-next-door appeal. Fan benefits are also aplenty – besides a guaranteed high-touch for everyone, you might also get the opportunity to take group photos as well as receive exclusive selfie polaroids and signed posters from the Lovelyz members. Can local Lovelinus get any luckier? 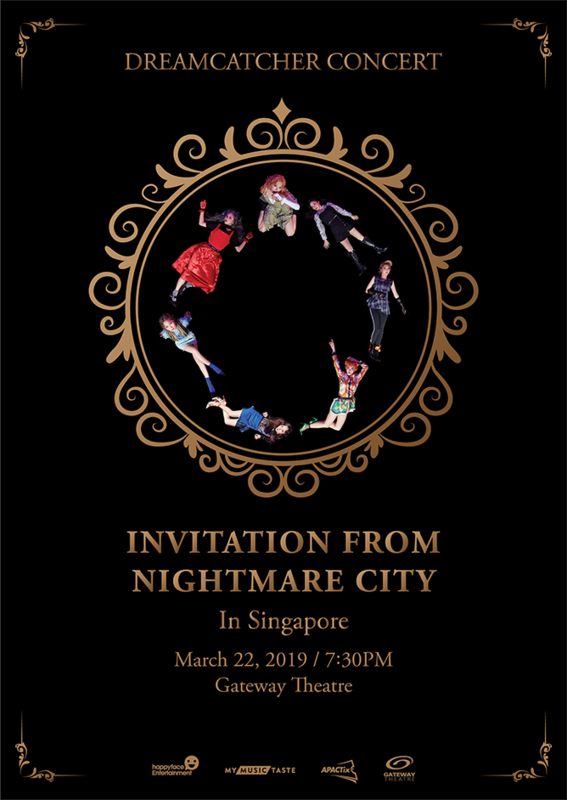 Just days after, fans can get ready to welcome Dreamcatcher back to our shores, who will be embarking on their Southeast Asian tour titled Invitation from Nightmare City. Hot on the heels of their recent comeback with ‘Piri’, the charming ladies of Dreamcatcher will be here to enthral fans with their addictive blend of horror movie-esque stylings and rock-heavy elements that are unlike anything you’ve ever seen before. 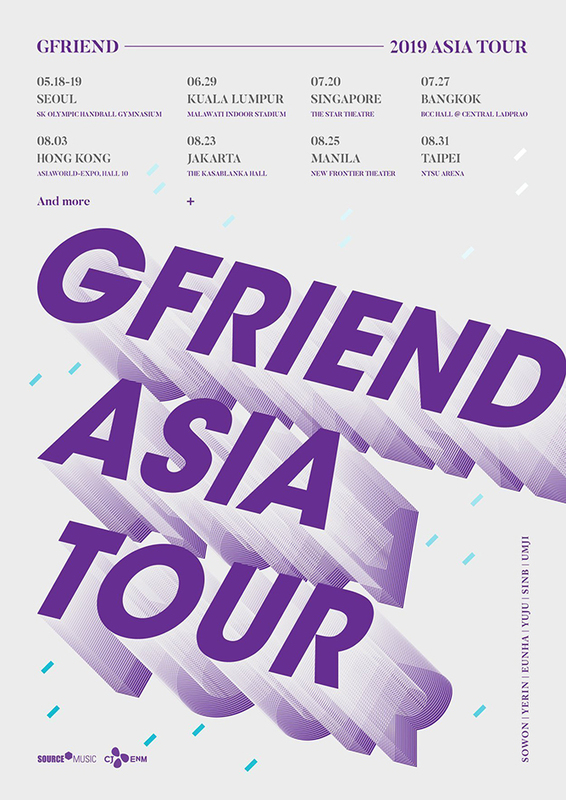 That’s not all – GFriend has also dropped dates for their upcoming 2019 Asia Tour, which includes Hong Kong, Kuala Lumpur, Jakarta, Manila, Bangkok, Taipei and of course, Singapore. Known for their string of bright melodies and upbeat dance numbers like ‘Me Gustas Tu’, ‘Rough’ and their recent hit ‘Sunrise’, fans are in for an electrifying time with the girls of GFriend. Fellow fanboys (and girls), it’s time to start saving up! Tickets will go on sale 23 February 10am via www.apactix.com. Tickets are now available on www.apactix.com. Ticketing details to be revealed at a later date. Which of these K-pop girl groups do you stan? Tell us in the comments below!